Miss Harriet, an Orlando, FL-based face painter, began her business as a part time opportunity to share her love of storytelling, guitar and singing as the character Miss Harriet. Years later, people recognize her from these early gigs at the local Borders Bookstores. 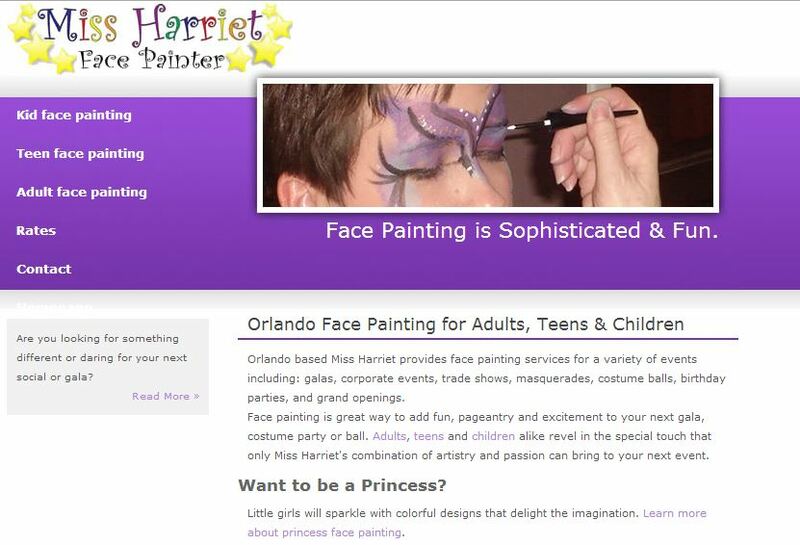 Not unlike many business owners, Miss Harriet recognized an opportunity to shift her focus to face painting for kids, teens, and adults as the core of her business. Miss Harriet's website was in need of a makeover. And with mobile website visits increasing rapidly year over year it was time to make the site mobile friendly. We worked with Miss Harriet to increase her branding, and positioning while preserving previous SEO efforts. Staying on the WordPress platform made the update a straightforward and more cost effective solution. Responsive, WordPress website re-design. The re-design delivers Miss Harriet's brand, services & rates in a colorful and mobile responsive way. This gives visitors regardless of device a full picture of Miss Harriet's capabilities and flair.